Ever since the T-H Marine FLW Bass Fishing League All-American awarded $100,000 to Shaw Grigsby in 1984, $100,000 paydays have become commonplace in the ranks of professional fishing. Yet, through it all, the BFL All-American has retained its essence: a place where a workingman can still springboard his hopes and dreams of professional fishing into a reality from divisional and regional competition. Paving the way for a Pro career. The history of the All-American has propelled the careers of some of the top pro fishing names we know today. Along with Grigsby, other pros such as Rick Clunn, Joe Thomas, Stephen Browning, Clark Wendlandt and Jacob Wheeler have used an All-American $100,000 win to fuel their careers. Today, that All-American tradition was carried on by Nick LeBrun of Bossier City, La., whose All-American win at Cross Lake reads like a story book. As a 33-year-old tackle manufacturer’s rep, LeBrun has been preparing himself for a professional fishing career over the last few years. Today, he made great strides in achieving that dream by hauling in 62 pounds, 8 ounces of Cross Lake bass over three days to emerge victorious. From the beginning, LeBrun’s story had a “meant to be” feel. LeBrun qualified for the BFL Regional on the Red River in October via the Cowboy Division, and he qualified for the Cross Lake All-American by a tiebreaker at the Regional, earning the final qualification spot. The tie was broken by the bigger one-day limit, which was earned by LeBrun. After qualifying for the All-American last October, Lebrun lost his father, Billy LeBrun, to cancer in February. During the All-American week on Cross Lake, the tournament turned into a high-weight shootout between LeBrun and another local, his good friend Randy Deaver of Blanchard, La. The two have fished the waters around Shreveport together for years. That special moment set the tone for what would turn into an even more special week. LeBrun checked in the heaviest weight of the event on day one – 26 pounds, 9 ounces – to take the early lead. On day two, he faltered a little bit, checking in just 16 pounds. Meanwhile, his friend Deaver stole the show – and the lead – with a massive 25-pound, 3-ounce limit. Starting the final day 3 pounds, 6 ounces off the lead, LeBrun knew he had his work cut out for him. He was going to need a special day. As the takeoff ceremonies commenced this morning, the random music playing from the loud speakers cued up Alan Jackson’s Small Town Southern Man. At that moment, LeBrun felt a calming presence come over him. From that point on, LeBrun fished with the confidence and momentum he had on day one. He went to work banging a 6th Sense Movement 80X crankbait into cypress tree bases to trigger reaction bites from big bass. During the day he tricked two 5-pounders and a 4-pounder into inhaling the crankbait after ricocheting of a tree. While many of his competitors flipped the same cypress trees with soft plastics or jigs, LeBrun stuck with the crankbait, exemplifying the extreme patience it takes to deal with a crankbait’s sticky nature around gnarly roots. He also likes the bait because it’s a bit heavier than other crankbaits of its diving-depth class, allowing him to more easily pitch it under gangly limbs. Then he would “steer” the bait with the rod and far-reaching body English to make the lure contact trees and particular ambush points at the bases. Many of LeBrun’s strikes were short-range strikes, requiring a rod with a certain degree of forgiveness. 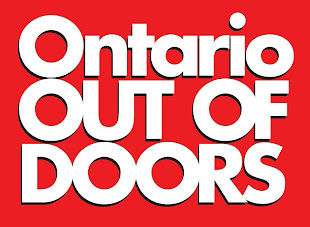 For that he used a 7-foot Fitzgerald Rods Bryan Thrift cranking rod in a medium-heavy action spooled with 17-pound-test Bass Pro Shops XPS fluorocarbon. The key areas in the cypress-strewn bayous were places that featured subtle drains and troughs running through them. Though the crankbait did most of the damage during the week, LeBrun also used a SPRO popping frog to bail him out on the second day. 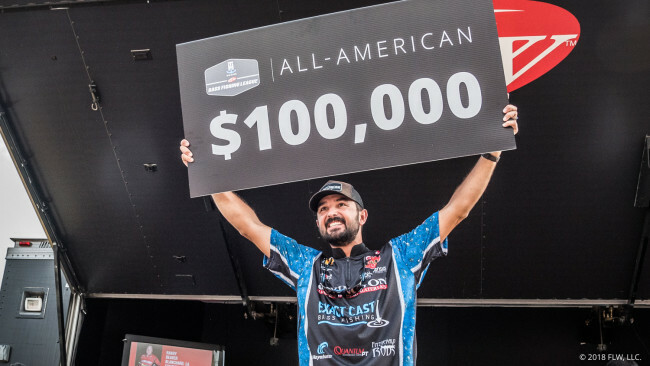 After holding up his $100,000 check and trophy, LeBrun dedicated his win to his late father, Billy, who got to watch his son catch nearly 20 pounds on the final day of the All-American – from right there inside the boat.